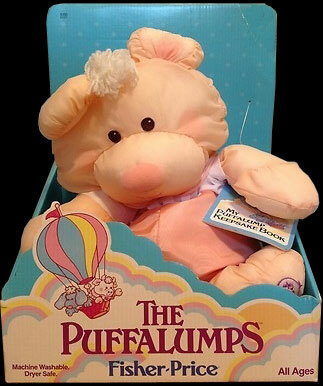 Description: This extra soft feather light Puffalump bear cub was one of the first six Puffalumps made by Fisher-Price, see #8000 Puffalumps Assortment for a list of the other five first Puffalumps. Bear Cub was sold with a one-piece removable jumper outfit. Although the Fisher-Price dealer catalogues only show the peach version, this bear cub was also available in blue wearing a blue pleated-front romper exactly like the #8003 Puppy's outfit. FPT10147 - Peach Puffalump bear cub made of extra soft fabric. He is feather light, has white yarn sprouts of hair on top of his head, brown stitched eyes, a pink nose, and a stitched mouth. He has round peach ears, peach arms and legs, and peach paws. He has the Puffalump trademark symbol on the bottom of his left foot, click here for a photo of the symbol. FPT10148 - Peach colored sanity "shorts" with an attached white short-sleeve shirt. The shorts have 2 round white embroidered buttons on the front. The shirt has 3 pleats on the front with 3 peach stitched dot "buttons" on the center pleat, and a white collar with peach on the edge. The back of the outfit has two Velcro® brand fasteners. FPT10149 - Blue Puffalump bear cub made of extra soft fabric. He is feather light, has white yarn sprouts of hair on top of his head, brown stitched eyes, a pink nose, and a stitched mouth. He has round blue ears, blue arms and legs, and blue paws. He has the Puffalump trademark symbol on the bottom of his left foot, click here for a photo of the symbol. FPT10150 - Dark blue one-piece romper outfit with a white pleated bib-shaped chest. The jumper has sleeves with folded cuffs on the ends, the blue collar has a thin pink trim on the edge, matching the pink trim edge that borders the bib on the chest. The jumper has cuffed leg holes. FP8006BOXA1986 - (Box Only) Sold in a 11" long, 14" high, 8-5/16" deep hands-on (non-enclosed) display box with a BLUE backdrop panel. Top right corner of backdrop panel is marked, "8000 Asst.". This box has pastel colored clouds and Puffalumps in a hot air balloon on the front. FP8006SETA1986 - (Complete Set - Peach Bear Cub) Complete set in original BLUE display box. FP8006BOXB1986 - (Box Only) Sold in a 11" long, 14" high, 8-5/16" deep hands-on (non-enclosed) display box with a ? backdrop panel. Top right corner of backdrop panel is marked, "8000 Asst.". This box has pastel colored clouds and Puffalumps in a hot air balloon on the front. FP8006SETB1986 - (Complete Set - Blue Bear Cub) Complete set in original ? display box.